Shrimp and a pesto mayonnaise spread are added to the traditional bacon, lettuce, and tomato sandwich. Purchase deveined shrimp to keep the preparation time at less than 30 minutes for this recipe. 1 of 4 In a large nonstick skillet, cook the turkey bacon over medium-high heat until crisp, about 5 minutes. Drain on paper-towel-lined plate. 2 of 4 In a small measuring cup, mix together mayonnaise and 1 tablespoon of the pesto. Set aside. 3 of 4 Heat broiler. Place shrimp on a lightly greased broiler pan and brush with remaining 1 tablespoon pesto. Broil for 2 minutes per side. Remove to a plate and keep warm. 4 of 4 Spread each slice of toast with about 1-1/2 teaspoons of the pesto mayonnaise. 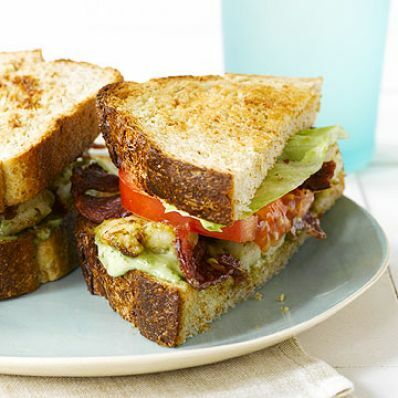 Evenly distribute shrimp among 4 slices of the bread and top each with 2 slices of bacon, tomato and lettuce. Top each with the remaining bread slices.